When children are seated in the rear outboard seats, they must be seated in the proper child restraint system. Make sure to position the child restraint system as far away from the door side as possible, and secure the child restraint system in a locked position. Do not allow the passengers to lean their heads or bodies against the doors, put their arms on the doors, stretch their arms out of the window or place objects between the doors and passengers when they are seated on seats equipped with side impact and/or curtain air bags. Never try to open or repair any components of the side and curtain air bag system. This should only be done by an authorized Kia dealer. Failure to follow the above mentioned instructions can result in injury or death to the vehicle occupants in an accident. Problems may arise if the sensor installation angles are changed due to the deformation of the front bumper, front end module, body or front doors and/or B pillar where side collision sensors are installed. Have the vehicle checked and repaired by an authorized Kia dealer. Installing bumper guards (or side step or running board) or replacing a bumper (or front door module) with non-genuine parts may adversely affect your vehicle’s collision and air bag deployment performance. 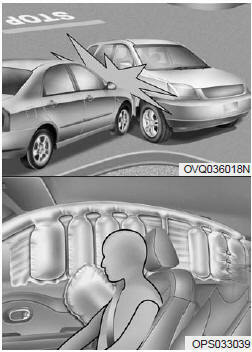 Side air bags (side and/or curtain air bags) are designed to inflate when an impact is detected by side collision sensors depending on the strength, speed or angles of impact resulting from a side impact collision. Also, the side and curtain air bags are designed to inflate when a rollover is detected by a rollover sensor. Although the front air bags (driver’s and front passenger’s air bags) are designed to inflate in frontal collisions, they also may inflate in other types of collisions if the front impact sensors detect a sufficient frontal force in another type of impact. 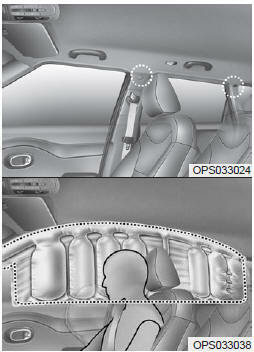 side and curtain air bags are designed to inflate in certain side impact collisions. They may inflate in other type of collisions where a side force is detected by the sensors. Side air bag and/or curtain air bags may also inflate where rollover sensors indicate the possibility of a rollover occurring (even if none actually occurs) or in other situations, incluiding when the vehicle is tilted while being towed. Even where side and/or curtain air bags would not provide impact protection in a rollover, however, they will deploy to prevent ejection of occupants, especially those who are restrained with seat belts. Just before impact, drivers often brake heavily. Such heavy braking lowers the front portion of the vehicle causing it to “ride” under a vehicle with a higher ground clearance. Air bags may not inflate in this "under-ride" situation because deceleration forces that are detected by sensors may be significantly reduced by such “under-ride” collisions. Front air bags may not inflate in rollover accidents because front airbag deployment would not provide additional occupant protection.